Surface tension plays an important role in inkjet printers as it affects drop formation and satellite formation, as well as the interaction with the substrate. Viscosity (or strictly, shear viscosity) is a critical parameter that mediates the flow through the printhead nozzle. Due to high flow rates and small nozzle diameters the fluids operate in a high shear rates regime. Viscosity also has an impact on the filling of ink into the printhead ink chamber. Many inks are termed 'Newtonian' meaning the viscosity is constant with the applied shear rate. Additives like polymers or other materials can change this behavior so viscosity is no longer constant with the shear rate, referred to as a 'non-Newtonian' behavior. The viscosity generally decreases with increased shear rate and this is called a 'shear-thinning' fluid (the opposite phenomenon where viscosity increases with shear rate is termed a 'thixotropic' fluid). In the nozzle the ink is both sheared and elongated and the elongational viscosity is important to understand since it affects the formation and break-up of the ink filament and subsequent drop formation. Viscoelasticity is used to describe a material that has both viscous (liquid) and elastic (solid) character. The degree of viscoelasticity depends on the additives and/or the concentration of additive. Viscoelasticity can be characterized to some extent using rotational techniques, but often oscillatory measuring techniques are used. The Weissenberg number relates sample relaxation time to process time, the Intrinsic Deborah number relates the sample elasticity to inertia. Weber number shows the relations between inertia and surface tension, Ohnesorge number shows the relation between viscosity and surface tension and inertia and for a common inkjet ink the Ohnesorge number should be between 0.07 < Oh < 1. The capillary number shows viscosity versus surface tension and the also capillary number relates elasticity and surface tension versus inertia. The instantaneous viscosity is dependent on the timescale of applying shear stress or shear rate. The instantaneous viscosity differs since it measures non-bulk properties. The equilibrium viscosity is obtained after a time when the measured viscosity equals the bulk viscosity. The equilibrium flow curve is the reference curve for all viscosity data and is a result of measuring the sample as function of shear rate or shear stress. Equilibrium viscosity curves are used to determine if a sample is Newtonian (i.e. the viscosity is independent of shear rate) or non-Newtonian. Yield stress is the minimum shear stress that is required to break the internal structure of an ink and start flow. Determined in a linear ramp of shear stress, the yield stress is defined as the maximum in the viscosity curve measured. All viscosity data are instantaneous viscosity data as defined above. Many highly viscous samples have a composition in which its components form a three-dimensional structure. This structure is a time-dependent property, so the thixotropy can break down under shear. The breakdown speed is different at different shear rates and also between different samples. This relationship can be used to monitor the diffusion of a particle. If the viscosity of the continuous phase is known, then the particle size can be determined. Conversely, if the particle size is known the viscosity can be determined. The timescale over which the diffusion can be correlateddepends on sample viscosity and particle size: larger particles or a higher viscosity gives a longertimescale on which the correlation can be performed. Timescales as short as micro seconds are obtainable indicating the possibility to measure viscosity at high shear rates. Viscoelasticity in inks are of interest if samples are non-Newtonian and can be determined with a range of techniques depending on the viscosity range. Higher structured inks for instance for 3D printing or more traditional printing methods utilize oscillatory frequency sweeps at different temperatures to reach higher frequencies using time temperature superposition. The viscoelasticity is characterized by two main parts: the solid-like or elastic modulus G’ and the liquid-like part or viscous modulus G’’. The ratio between G’’ and G’ is called the tand representing the loss factor or dampening factor. As a stability criterion, the amplitude sweep is used to determine the possibility for the sample to resist particle sedimentation since some pigments, for example in ceramic inks, are high density compared to the base media. Sedimentation will result in poor ink performance and can be changed by density matching or by improving the rheological properties of the sample. 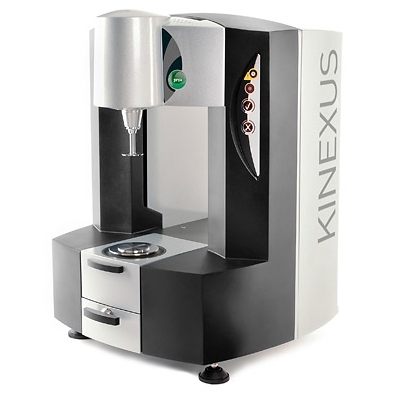 Micro-rheology tests are performed by adding tracer particles to a base fluid with additives or to an ink without pigments since the technique is only viable without multiple scattering between particles. This will give an understanding of the movement over short time scales corresponding to high frequency or high shear rates. These measurements are typically performed by DLS (dynamic light scattering), DWS (diffusive wave spectroscopy) or high speed photography using mechanical or magnetic tweezers. Extensional viscosity is for a Newtonian liquid three times higher than the shear viscosity measured in an equilibrium flow curve. Extensional viscosity is not about the alignment of a polymer in the direction of flow but the internal resistance arising from the stretching of the polymer. For some systems the elongational viscosity can be more than 100 times higher than the shear viscosity. In summary, inkjet ink viscosity is a complex topic that can require specialist equipment and techniques to characterise fully. The viscosity mediates drop formation as well as substrate behvaiour so is a vital parameter to understand in ink development. Mats Larsson from Malvern Instruments will describe the use of characterisation equipment to measure the rheological behaviour of inkjet inks at the IMI Europe Inkjet Ink Development Conference in Lausanne, Switzerland, 15-16 March 2017.